Forward Marcus Morris unloaded to reporters after the Boston Celtics gave up a 28-point lead in a loss to the Los Angeles Clippers on Saturday night. 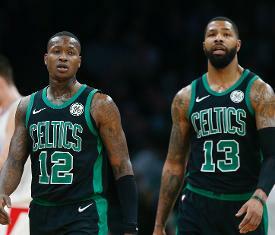 "For me, it's not really about the loss, it's about the attitude that we're playing with," Morris said, per Boston.com. "Guys are hanging their heads. It's not fun. We're not competing at a high level. Even though we're winning, it's still not fun. I don't see the joy in the game." Landry Shamet made four 3-pointers in the fourth quarter and scored 17 points off the bench in his debut with the Clippers, helping them rally for a 123-112 win. It was the largest comeback by any NBA team in the past two seasons. The Celtics blew an 18-point lead against the Los Angeles Lakers two nights earlier. "I watch all these other teams around the league and guys are up on the bench - they're jumping on the court, they're enjoying their teammates' success," Morris said. "They're enjoying everything, they're playing together, and they're playing to win. And when I look at us, I just see a bunch of individuals." Morris started and scored 15 points and had six rebounds in the loss. He said if a move to the bench helped the team, he'd be all for it. "We have to genuinely want to win. That has to be the first goal. Whatever that takes, I'm with it. If they want to take me out of the starting lineup, get some juice in there, I'm with it. I'm trying to win." Boston's leading scorer, Kyrie Irving, scored 14 points before sustaining a right knee sprain with about four minutes left in the first half, and he did not play in the second. He's expected to undergo testing on the knee on Sunday.